Trump’s Tweets Today (February 18, 2018 Edition). Last July I did a “Trump’s Top Ten Worst Tweets As President” list. Most of those would not even make the top 10 again today. They would be displaced by stuff like the moronic comparing of nuclear buttons, senselessly damaging relations with our closest ally Britain First tweets, supporting an accused child molester, ironically bragging about his “very stable genius,” and so on. I considered making an updated list but, frankly, the pool of deplorable, idiot, dishonest and flat out lying tweets is so deep I was afraid I would drown in them and be old before I could finish researching and culling the list. If Trump’s tweets were ever sensible and truthful it would create a Twilight Zone of an alternative universe of honest Trump tweets. 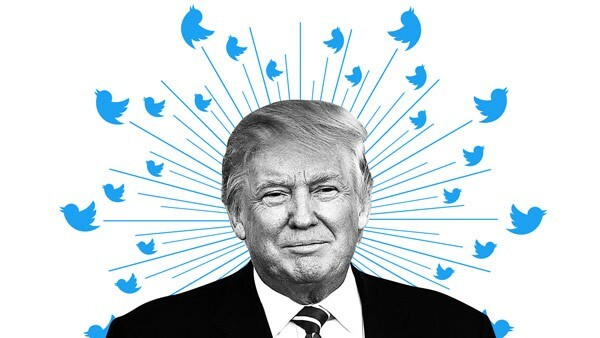 So today I am going to focus on just Trump’s tweets for two days. Call it a Pre-President’s Day Twitter Storm Meltdown. The news of Mueller indicting 13 Russians and 3 Russian companies for meddling in the election once again pushed the President of United States into reality defying insanity. The tantrum certainly works hard to be the kind of overreaction that suggests he is guilty as Hell. There were so many just that last couple of days that even confining it to just two days I scarcely know where to start . . .
Well Mr. President, it wasn’t China. It wasn’t another country or group. It wasn’t a 400 pound genius sitting in bed with a computer. IT WAS RUSSIA. You were wrong, wrong, wrong. Just say it. Everyone telling you it was Russia was right and you were wrong. And with the exception of Breitbart and Fox & Friends it was everyone that was telling you it was Russia. McMaster didn’t forget to say it. He didn’t say it because no such conclusion has been reached. It’s impossible to know whether the Russians impacted the election. We know they sure tried. We know Trump’s son and Kellyanne Conway retweeted the Russian propaganda that was part of this Russian criminal enterprise. Whether unwitting or not, Trump’s son and Conway were tools for Russian propaganda. One of the fake Russian propaganda posts that Trump Junior retweeted involved allegations of election fraud. Allegations that Trump himself echoed. Actually, Obama imposed sanctions, which the then President-elect Trump, secretly working with Michael Flynn, sought to undermine. Flynn is now a convicted criminal for lying to the FBI about that. Obama also sought bipartisan condemnation of the Russian meddling, but Senate Majority Leader McConnell, under pressure from Trump, refused to go along. Later Congress overwhelmingly passed sanctions against Russia which Trump has refused to implement. Yep, the Russians are laughing their asses off that Trump’s son and Kellyanne Conway retweeted their propaganda and that Trump echoed it in his public charges of election fraud. The Russians are laughing their red asses off that Trump had Flynn secretly try to undermine Obama’s sanctions for election meddling and then Trump just watched as Flynn was convicted for lying about it. The Russians laughed even more when Trump refused to implement the sanctions passed by Congress. The real revelation of the Mueller indictments of the Russians is quite simple. Russia’s crack team of KGBers heavily researched what was the best way to hurt America. When they were done, they concluded it was to help Donald Trump get elected. Think about that Trumpers. Think hard. In a very deep pool of vile Trump tweets this may be the lowest of all. To so cynically use the tragedy of mass killings in Parkland Florida to attack and attempt to stop the investigation of him involves a moral bankruptcy I can’t comprehend. Trump is using the death of these children for his own self gain. I’m not sure how even his strongest supporters can stomach this one, but I know his personality cult will have not problem with it. All of this moves us to a tweet that is almost frivolous compared to some of the above. Here’s the poll Trump is talking about. 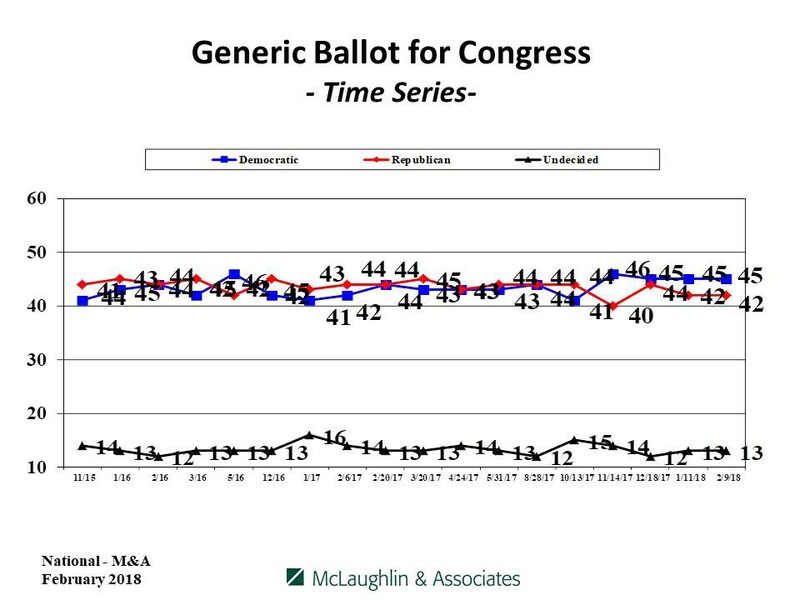 This is the graph summarizing the particular polling related to the generic ballot. This is the gratuitous “what about Clinton/Obama” tweet (there’s actually more than one). There was no investigation because it was done openly, as part of a public agreement restricting Iran’s nuclear program. Perhaps the biggest point is that it was Iran’s money, we just gave back. All of this dishonesty, and just lunacy, constitute “official statements” of the Office of the President of the United States. This was not even close to all the tweets the President has done in the last two days.